My sister's Indian friend taught her to use radish to cook curry. Since then, my personal preference has always been radish in my curries instead of using potatoes. However, because of my family's preference for potatoes, I have always refrained from using radish. Today I made an exception. 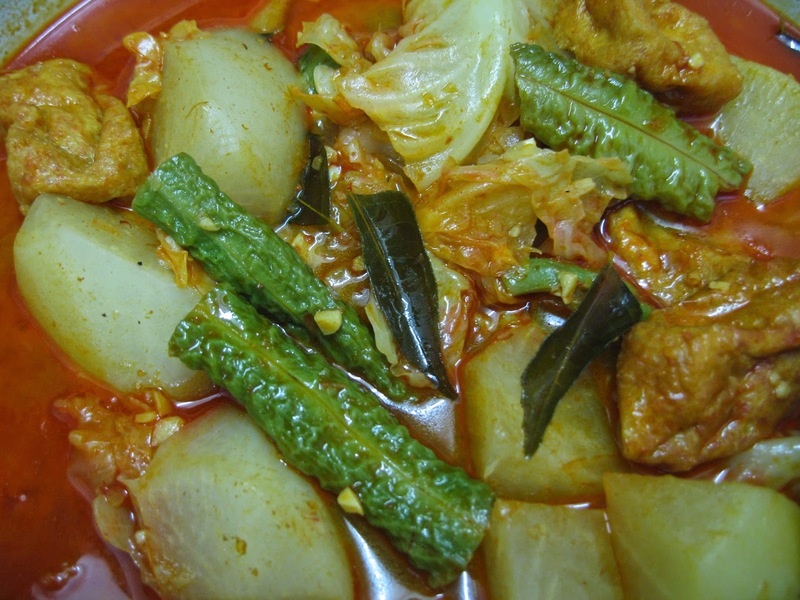 I re-introduced the use of radish for cooking a mixed vegetables curry. 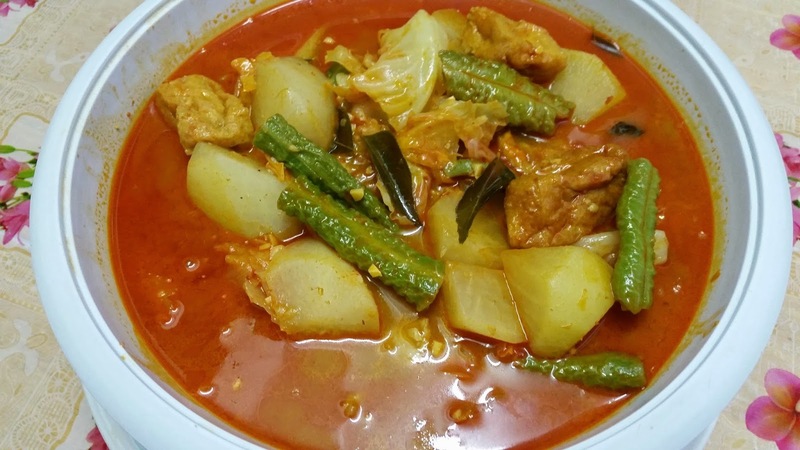 I am not sure whether it was because I have not been cooking mixed vegetables curry for a long time or because the family has a change of preference, but the bottom line was that the two large bowls of curry were demolished. Nobody grumbled about not finding potatoes. Everybody ate happily and polished off the rice and the vegetables. The quantity I cooked could easily feed five to six people yet the three of us wolfed down everything. 1. Heat wok until hot. Add in oil. Saute minced garlic and shallots for 1 minute over medium flame. Keep stirring to prevent burning. Add in the bruised lemon grass and curry leaves. Continue to fry until fragrant. 2. Add in minced chilli paste and stir to mix well. Add in half a cup of coconut milk and stir-fry until oil oozes out. 3. Add in radish and snake beans and fry for 2 minutes. Add in water and the remaining coconut milk. 4. Bring to a boil. Then add in tofu puff and cabbage. Let it boil for 15 minutes or until the radish is tender. 5. Add in seasoning ingredients. 6. Switch off flame and dish up. 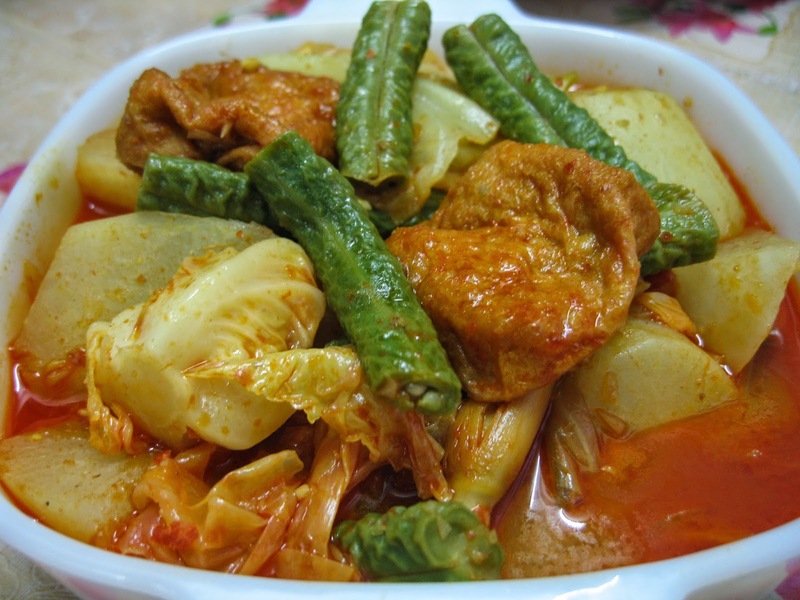 Hi Doris, your mixed vegi curry was so tempting, like it . I used "Babas" brand curry powder. Thank you Doris....I assume it's babas meat curry powder? I Have tried a few of ur dishes...all were just lip smackin gd.....can't wait to try this curry!!! Your assumption is correct and thanks for the feedback. These 3 studies from large medical magazines are sure to turn the traditional nutrition world around!